BELLE ISLE NANCY BROWN MEMORIAL TOWER photo picture art print for sale. 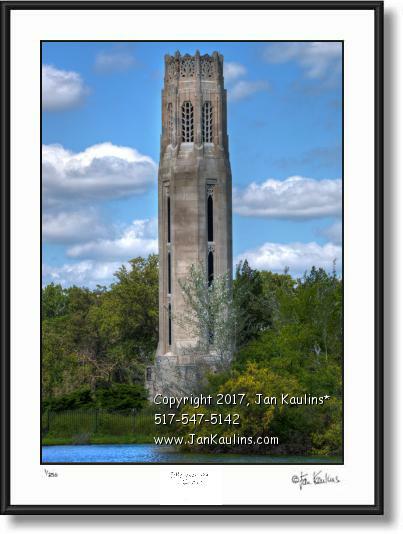 This DETROIT BELLE ISLE landmark photo picture art print is of the Nancy Brown Memorial Carillon Bell Tower. It shows this historic structure on a beautiful summer day with colorful foliage surrounding it and blue skies with white clouds overhead. Construction began in 1939 and the tower was dedicated in 1940. Brown was an extremely popular advice columnist for the Detroit Newspapers in the 1930's. Starting in 1934 Brown began having what became extremely popular sunrise worship services on Belle Isle.